The Introduction to Mountain Scrambling (IMS) is a 5 day course. 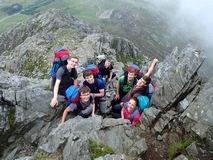 The aim of this course is to introduce students to mountain scrambling on easy to moderate graded scrambles. This is a natural progression in summer mountaineering for any Senior Cadets or CFAVs who have completed the SMF and/or anyone who is seeking additional log book experience. The content includes clothing, equipment, rope management, belaying, guide book use and route selection. The outcome is for the candidate to be a competent member of a team led by a qualified Mountain Instructor.